Scroll down for the #cpchat conversation report for December 15th, 2018 EST. When it comes to participants, we ranked 28th among 389 conversations. In terms of the number of posts, we ranked 28th out of 389 conversations that took place. This conversation ranked 34th out of 389 in terms of the amplification of ideas & content. There were 25 reshares, 36% of posts, during the course of the conversation. 70% of participants in this conversation shared a total of 5 unique pieces of content. Principal/Dir. of Special Ed. West Muskingum Local Schools, Co-Author of Your School Rocks...So Tell People! Taught for 12 years. Muskingum '99, Xavier '01. 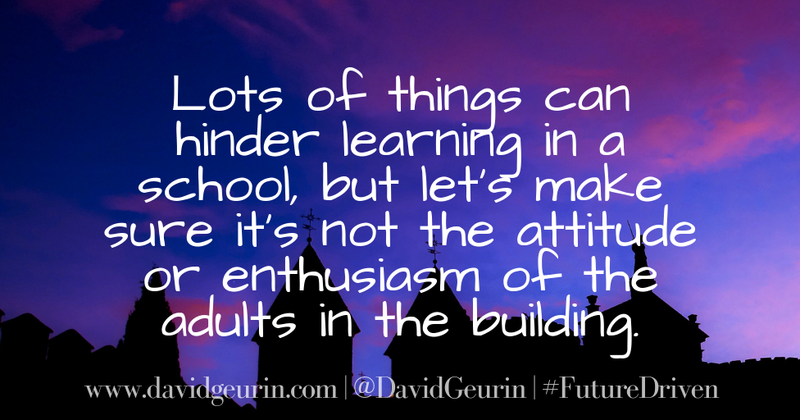 The @DavidGeurin Blog provides ideas and inspiration for busy educators who are committed to growth and learning.